I dyed this. We were short two skeins of Skinny Bugga! in one batch, so we put these in to fill it out, and that happened to be one of the pots I did. So, I had to buy them as a souvenir of my new job. And yes, I DO have the best job ever. In spite of a number of days when I thought my fingers would fall off from the cold, and Kris having to wrap me in an electric blanket when I got home, I completely love what I’m doing. My fingers are frequently stained, but I love the women I work with, and I honestly look forward to going to work every day. I’m the luckiest woman ever. January 15th, 2010 | Category: Misc. Absolutely gorgeous! And I’m so glad you’re loving your job. Woohoo! Gratz on the full month of employment! It’s wonderful when you can say you love doing what you’re doing! 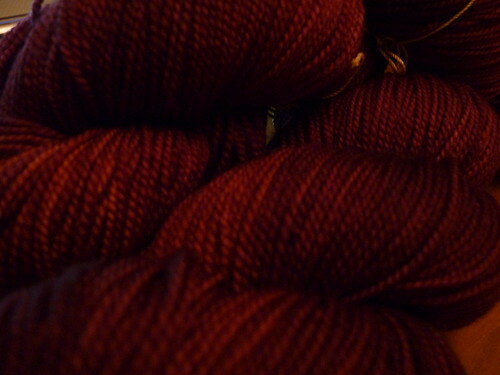 Love those skeins. You’re getting really good at that dye thing :)! Gorgeous!! And yes, I’d have to agree with you! Pretty fabulous job! Very pretty! Glad you’re having fun! How awesome a job is that, well despite the cold though! 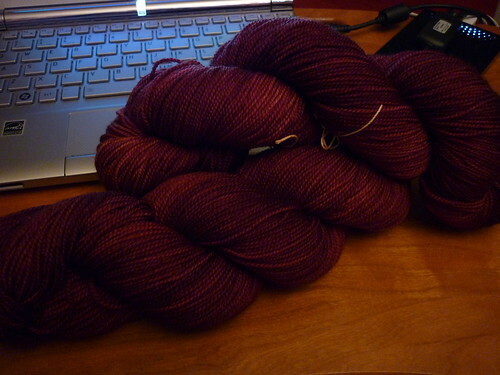 Those skeins are gorgeous! Pretty, Pretty? Congratulations on a great job? Wow awesome! I didn’t know you were working there! Congrats! Nice dye job! You’re very lucky to have a job that you love. It’s a rarity!